While vegetating on the couch one evening, looking forward to a night of binge watching content on Netflix, I came across a series hosted by Killer Mike titled, ‘Trigger Warning.’ Due to me living under a stone most of the time, I hadn’t heard of Killer Mike(aka Mike Render) before or knew anything about his background as one part of hip-hop duo Run the Jewels or as an activist. However, once I read some of the preview content from the series like changing the school system, a cola brand for the Crips and starting a new country, I thought this is going to be really interesting. With this type of content, there’s always going to be conflicts of opinion on screen and that makes for great viewing any time. I cannot recommend the series highly enough, but what caught my eye was the black Dodge Hellcat that Mike seem to be driving in a few of the episodes. Hmmm, it wasn’t a far stretch to think Mike would be into some form of Detroit muscle. There’s an interesting video online from House of Muscle with Mike’s 1996 Impala SS as below. GQ Website have an interview with Mike testing out a bunch of muscle cars – a Ford Mustang Shelby GT350R, a Chevrolet Camaro ZL1 and a Dodge Challenger SRT Hellcat Widebody. This article sheds a bit more light on Mike’s association with muscle cars and why. When asked what Mike regularly drives, the answer is, ‘My everyday car is the Dodge Hellcat.’ Blacked out with black tint. The car also brings people together, no matter the race or age. This point is highlighted after Mike recalls being stopped by a ‘old white guy’ who comments the car is beautiful and they have a conversation for 20 minutes about each other’s cars, past and present and thus find common ground. This happens four or five times a day. 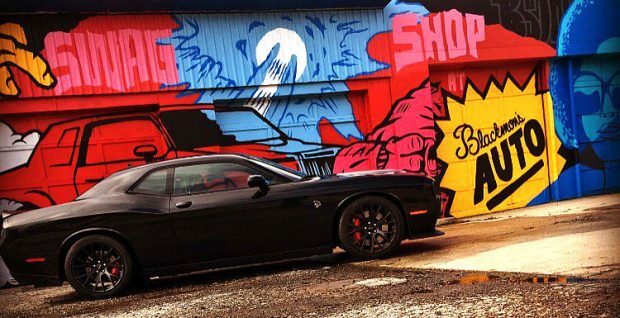 So, when asked does America need more Hellcats, Mike’s response is, ‘I think more muscle cars, period!’ A Dodge hellcat being the national symbol for community and integration could be a great idea….. So, a guy who is a world-class rapper, activist, socially aware and a fan of America muscle, which can be used as a focus point to bring all cultures together. What’s not to like….